We have had look at numerous Baan Training document, but none of them explained in terms which are easy to understand and easy to grasp for the Baan Technical Consultant / Baan Developers. Most of the documents speaks on vague topics and doesn’t have the right examples to support the different concepts available. To cut short, we have prepared a document which doesn’t boast on the number of pages it has (as it has bare minimum), but it definitely boasts about the simplicity of language used to make any layman understand the concept of Baan Technical with real ERP scenarios and examples. It not only covers functionality in easy to understand language but also gives real scenarios which one can associate with, thus making the understanding simpler. As said by great thinker’s, everything comes at a price. The things which you get for free is really not worth it. So for the effort’s we have put in to compile this ebook’s with all our experience put in to place, it is being sold for meager amount. Once payment is made drop a mail to fullonbaan@gmail.com. Will mail you the ebook. Alternatively if you dont have paypal account drop a mail to fullonbaan@gmail.com will provide details on how to avail this ebook. In the mail, kindly mention your Full Name and Contact No. Three segments of data must be considered – master data, transactional data and historical data. Most of the master data will come from your existing application; however, the new ERP application most likely has additional master tables and fields that will need to be populated to create a fully functional company. There are several approaches on managing the open orders. Depending on the volume of data and other internal factors, you may choose to handle these transactions in one of the following ways. 2. Process open payables in existing system. Hold checks until normal mailing time. Do not enter new vendor invoices in existing system if they will not be paid from that system. 2. Run a report of open orders. Manually enter the orders into the new ERP application. Historical data can be dealt with in several different ways. The benefits to the last approach greatly outweigh the other options. You do not need to keep your existing application up and running to access historical data. This eliminates the requirement to maintain the system and be concerned about user access to the data. 2. Implementation of a new ERP application is often the time organizations choose to make changes that have been under consideration for a while or changes where everyone has been waiting for the ‘right time’. Now is the time to evaluate your options. 3. The best way to get a head start on configuring your new production company, which results in a more efficient go-live conversion, is to set up a master company in parallel with the test environment(s). (a) It improves the performance of a program using it. (b) It helps to save memory as the functions in Dlls are shared among several programs running concurrently. (c) Functions in Dlls can be upgraded without having to recompile all the applications using it. (a) Can be used in other objects of the same session like forms, reports etc. (b) Can be used in other programs called from this program. (c) Cannot be used in functions of the same program script. (d) Cannot be used in event sections of the same program script. 3. Write the order of execution of the following event sections. 4. When a Display Session is invoked, which of the following sections of a form field get executed. 5. Which of the above starts a database transaction in Baan. 6. Which of the above ends a database transaction in Baan. (c) The UI choice standard options of ‘cont.process’ and ‘print.data’. (d) All the sections of a UI script. (a) while updating a record. (b) while deleting a record. (c) while inserting a new record. (d) to lock a record to prevent more than one process to update the same record simultaneously. 9. Which of the following is true regarding ‘retry points’ in Baan V.
(a) Retry points enable Baan V to re-execute a transaction after an abort transaction is produced by the database. (b) Retry points should always be positioned at the start of a transaction. (c) Only one retry point should be defined per transaction. (a) A DAL is implemented as a DLL to enforce the logical integrity rules for a particular table. (b) A DAL can enforce the logical integrity rules for two related tables. (c) A DAL doesn’t necessarily be linked to any table. 11. Which of the following are not advantages of DAL. (a) Enforcement of logical integrity rules for a table, irrespective of from where it is accessed. (b) Code reuse – Integrity rules do not have to be replicated in each session that uses a table. (c) Modularity – Separation of user interface actions (handled in UI script) and database actions (handled in DAL). (d) Performance improvement – DAL significantly improves performance of transactions on a table. 13. A UI script contains ‘check.input’ event section for a field of the main table and for a non-database form field. DAL for this table contains a property hook for the table field. User changes the value of both the fields on the form. (a) check.input event section will get executed for the main table field. (b) check.input event section will get executed for the non-database field. (c) Property hook will get executed for the table field. (a) The ‘check.input’ sections for fields of the main table are not executed. (b) The ‘check.input’ sections for non-database form fields are not executed. (c) The ‘when.field.changes’ sections for fields of the main table are not executed. (d) The ‘when.field.changes’ sections for non-database form fields are not executed. 1. There are ..…. types of forms. 2. Can one form be attached to more than one session? 3. What is the significance of field ‘Horizontal’? Ans: If this check box is selected, records are shown below each other. If this check box is cleared, records are shown side by side. 4. Forms are stored by ………. 7. Can form type and session type be different? 11. How do you attach User specific options on form? 16. Name different types of sessions. 17. Name different window types. 18. What is form type for dynamic session? 22. What is dynamic session? Ans: A session where the developer does not have to determine exactly where forms and fields are placed, or what they look like. Instead, the developer has to define the contents and structure of the session and the sequence of the object on the form. Dynamic sessions can be used to minimize the information that is displayed in a session for a particular user. For example, you can define the authorizations for a user so that certain forms and fields of a session are not displayed. 25. What is the significance of field ‘Synchronization’? Ans: If you generate a multi occurrence session (the Multi-Occurrence check box is selected), you can select this check box to synchronize the multi occurrence session with the single occurrence session that is filled in the Secondary Session field. Ans: Data Access Layer. Library with same name as table. Used to control logical integrity of Baan tables. 5. What are different types of Hooks in DAL? 6. What do you mean by Property Hooks? 7. What do you mean by Object Hooks? 8. Which are different Data Access Methods? 11. How do you retrieve error messages from DAL? 1. What is difference between function and DLL? 1. What are different types of Reports in Baan? 3. What are different types of Report layouts? DAL – Data Access Layer (Version 2) is supported in Infor’s latest version of Baan Software i.e. ERP LN 6.1. Compared to previous version of DAL which is supported in Baan V c, there are considerable amount of changes which DAL has undergone to support additional functionalities. I have had look at numerous DAL documents, but none of them explained in terms which are easy to understand and easy to grasp for the Baan Technical Consultant / Baan Developers. Most of the documents speaks on vague topics and doesn’t have the right examples to support the different concepts available in DAL. To cut short, i have prepared a document on DAL which doesn’t boast on the number of pages it has (as it has bear minimum), but it definitely boasts about the simplicity of language used to make any layman understand the concept of DAL with real ERP scenarios and examples. It not only covers entire DAL functionality in easy to understand language but also gives real scenarios which one can associate with, thus making the understanding simpler. As said by great thinker’s, everything comes at a price. The things which you get for free is really not worth it. So for the effort’s i’ve put in to compile this ebook with all my experience put in to place, i am selling it for meagre amount. 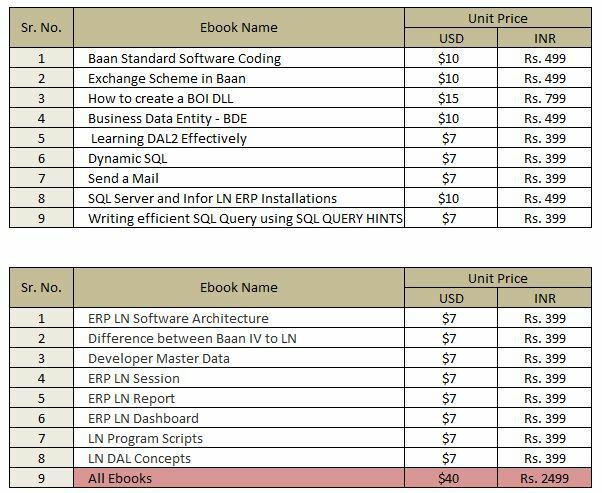 In order to book your copy of e-book ” DAL (Version 2) Simplified”, drop a mail to fullonbaan@gmail.com. Will mail you the details on how to avail this ebook and the price you need to pay. In the mail, kindly mention your Full Name and Contact No. Note:- With this e-Book, you get “DAL Exercise” ebook absolutely Free.